Vatican Puts St. Peter's Bones On Display For The First Time : The Two-Way In a surreal, emotional ceremony, Pope Francis held bone fragments the Catholic Church believes are the relics of the apostle St. Peter, who is considered to be the church's first pope. The relics have been shrouded in mystery and intrigue for years. That's Pope Francis, the 266th Bishop of Rome, holding what the church believes are the bone fragments of St. Peter, the apostle and the first bishop of Rome. 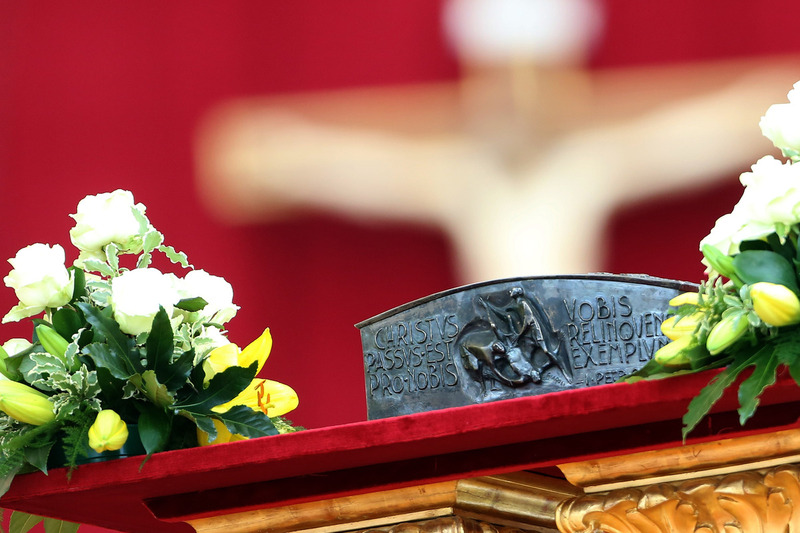 For the first time in nearly 2,000 years, relics of St. Peter the apostle (fragments of bone) are displayed for veneration. But the story is still alluring. The Guardian bases its story on The Ears of the Vatican, the 2012 book by Bruno Bartoloni. According to the book, the relics were discovered in 1939, as archaeologists were excavating in the grottoes of St. Peter's Basilica to bury Pope Pius XI. As they worked, they discovered a casket with an engraving in Greek that read, "Peter is here." "The scholar of Greek antiquities Margherita Guarducci, who had deciphered the engraving, continued to investigate and learned that one of the basilica workers had been given the remains found inside the casket and stored them in a shoe box kept in a cupboard. She reported her findings to Paul VI, who later proclaimed there was a convincing argument that the bones belonged to Peter. "Leading Vatican Jesuits and other archaeologists strongly denied the claim, but had little recourse.
" 'No pope had ever permitted an exhaustive study, partly because a 1,000-year-old curse attested by secret and apocalyptic documents, threatened anyone who disturbed the peace of Peter's tomb with the worst possible misfortune,' Bartoloni wrote." Rocco Palmo, who runs Whispers in the Loggia, the blog of record on the Vatican, writes that today's mass brings to an end to what's been an extraordinary "year of faith" for the church in an extraordinarily surreal way. During the past year, Palmo explains, we saw the first papal resignation since the 14th century and then the College of Cardinals chose the first pope "from outside Europe in over a millennium."